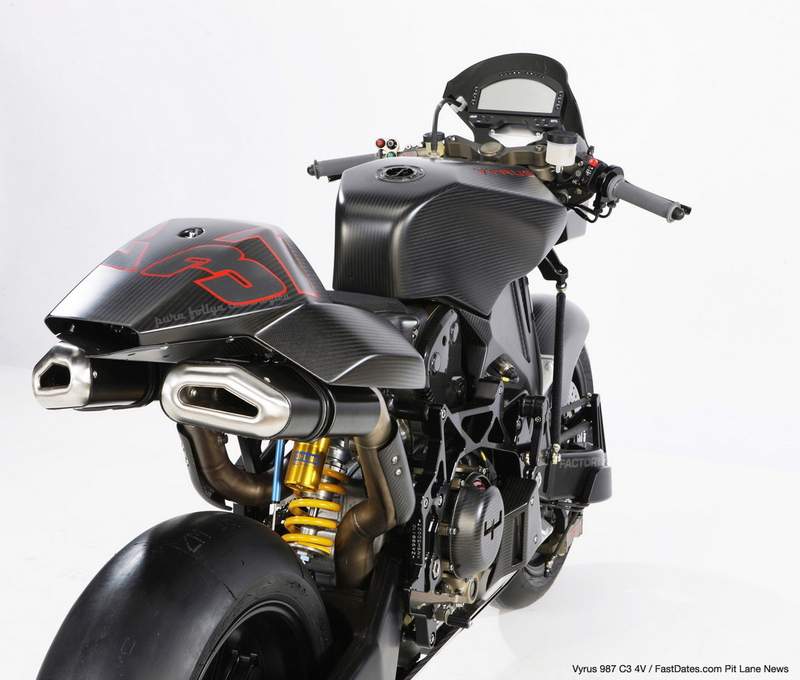 February 1st - Italian motorcycle manufacturer Vyrus recently revealed its latest piece of rolling superbike sculpture, the 987 C3 V4 naked superbike. 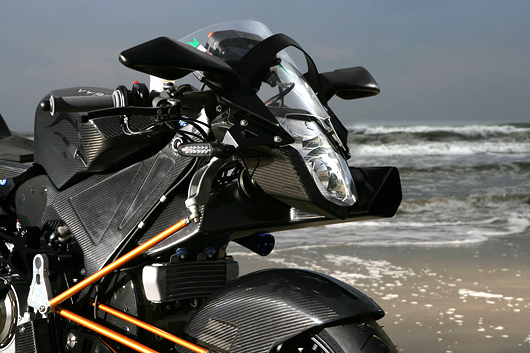 The machine is has a better power to weight ratio than Suzuki’s Hayabusa, Ducati’s Desmosedici RR or Kawasaki’s ZZR1400. 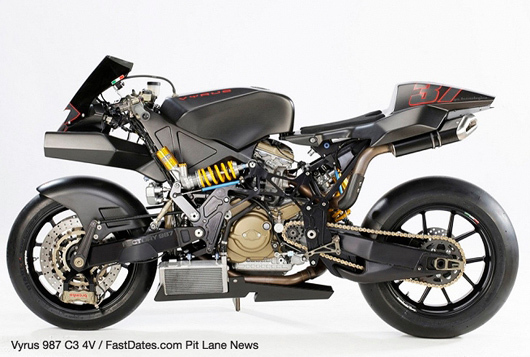 The new 4V revealed here is powered by Ducati's latest 170hp 1198cc Superbike engine and is the the lightest and most powerful of four Vyrus variants. 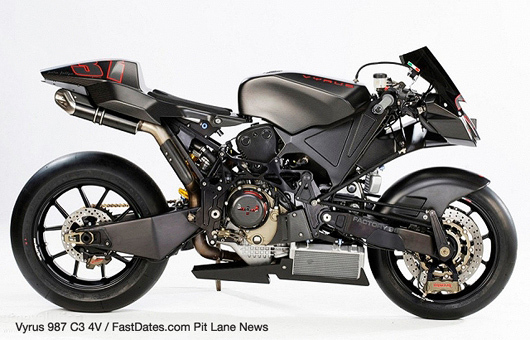 The base model 984 C3 2V comes with a 100 bhp two valve 1000DS air-cooled Ducati engine, weighs just 150 kg (a MotoGP bike weighs 148 kg) and sells for 33,400 euros (US$47,000). 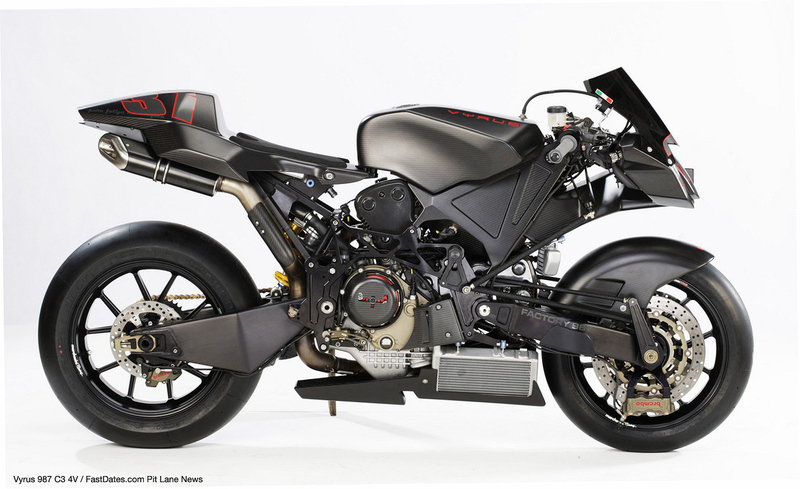 All new for 2010 and pictured here is the 987 C3 4V which weighs in at 155 kg/ 341 lbs., sells for a mere 55,000 euros (US$77,500) and uses the current water-cooled 1198/S (170hp) Ducati production Superbike engine producing 184 bhp with a race style exhaust system. 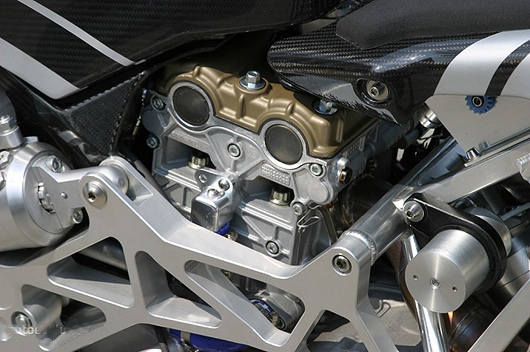 The bike does not use a fame, but rather has lightweight billet plates bolted to the engine, to where the suspension and bodywork components are attached. 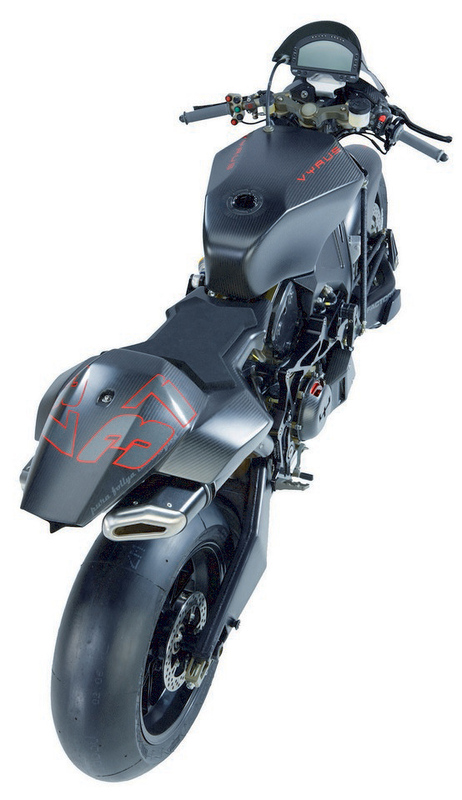 All of the bodywork including the gas tank are made from carbon fibre to help reduce weight even further. 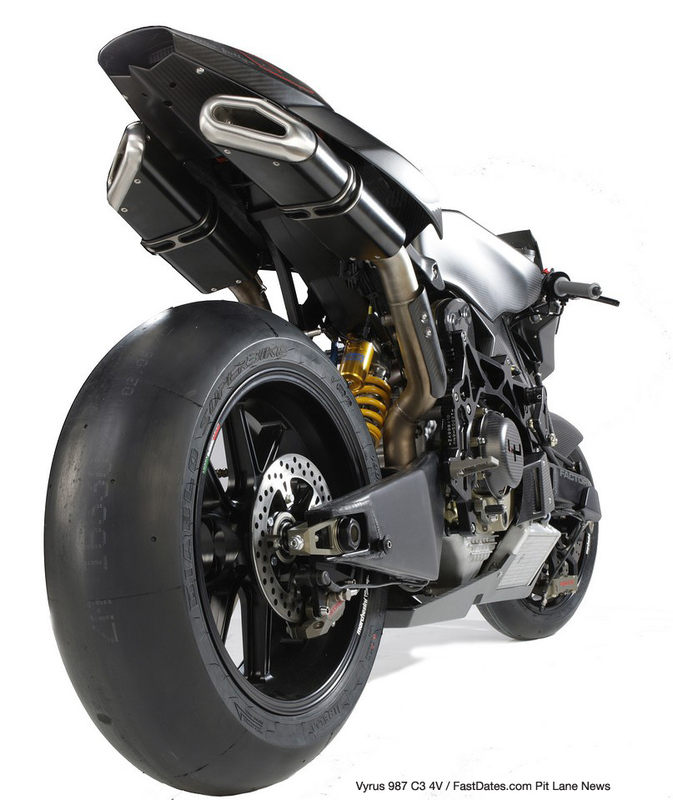 The front suspension is a single shock swingarm with center hub steering as pioneered by Bimota. Mostly show and not much go? 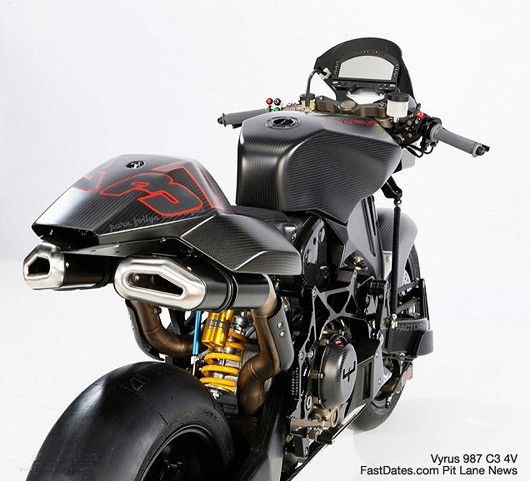 Despite the light weight and potent power output, the Vyrus 983 is 30 pounds too light to race in a sanctioned Superbike class, the lack of a fairing reduces its top speed significantly, and the awkard sideways radiator placement without an air scoop and fans make the engine prone to overheating if ridden too slow or too fast. Also claimed to be available is range-topping 987 C3 4V Supercharged which takes the 987 C3 4V and adds a supercharger for 10,000 euros more, just three kilograms more weight at 158kg/348 lbs, and 27 bhp for the title of being on of the world's the world’s fastest production motorcycles. The Vyrus name, however might not sound familiar for most of you, but its background is extremely solid. The engineers of the company are experienced in high-class motorcycles, as many of them worked for companies like Ducati or Bimota. The company is headed up by Ascanio Rodorigo, a man who worked with the famed Massimo Tamburini at Bimota in the early '80s.